I’ve talked about the importance of being a good financial role model previously. Our kids are always observing us and mimic our behavior, including how we handle and think about money. Even if you are not actively teaching them about money, they are still learning. 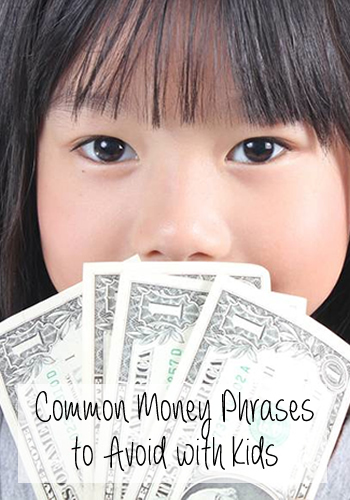 Today, I’d like to specifically focus on some common money phrases we use with our kids that we need to avoid. Over my 20 years as a financial advisor, I’ve witnessed how childhood observations and beliefs have influenced my clients. Many of these beliefs and habits originated from their parents and were unintentionally passed along. My clients took these lessons to heart, believed them and passed them along to their kids. We, as a parents, need to be conscious of how we speak to our kids about money and the emotions behind our words. We may be instilling habits and beliefs that are untrue and negatively influence their relationship with money. We’ve all been there: our kids are begging us to buy them a new toy, which they don’t need, so we use the old standby, “We can’t afford it.” While that may be true in some instances, the more honest answer may be that they don’t need a new toy. Those four simple words—”We can’t afford it”—may seem harmless to you, but to a young child, they can be incredibly scary. Young kids in particular can be very literal. Your “We can’t afford it” has planted a seed of fear within them. They now believe money is scarce and begin to worry. 1. Maybe you really can’t afford the toy. Or food. Or your home. Soon you’ll be homeless. 2. You say you can’t afford it, but you still spend money. Now you are a liar. From this, some kids will believe that money is scarce and something that causes worry, fear and makes grown-ups lie. It’s highly unlikely that was any parent’s intent so what is the better answer because buying your children everything they want is not the right answer either. When my girls find something they want and ask me to buy it for them. I remind them of our family goal and my choice to honor that goal because our family vacation is so important to me and to them. I explain how unplanned and unneeded items affect our ability to achieve our goal. They can choose whether they want to use their money to buy the toy. More often than not, they decide it’s not worth their money (and delaying their own goal achievement) and walk away without feeling deprived. I’ve seen parents simply tell kids credit cards are bad and to avoid using them, rather them teach them how to use them wisely. The problem is your kids are going to see many people, including loved ones, use credit cards. Suddenly, Grandpa and Grandma are bad people for using them. Or they see you use them. Once again, you are telling them to not do something that you do, leaving them confused. People may abuse the privilege credit cards offer but that does not make them bad—the credit card or the person. 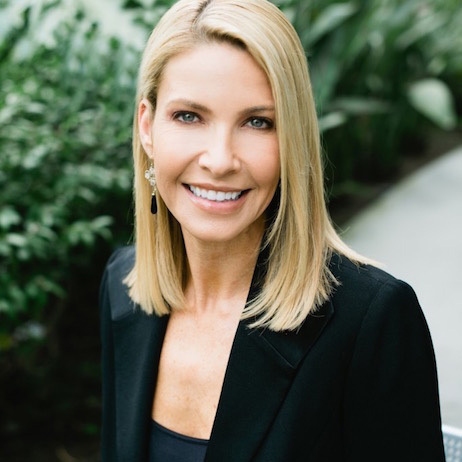 The more important lesson is to teach our kids that credit cards are not free money and to not use them to extend their lifestyle, which is a common mistake. To show our kids how to use them responsibly and to our advantage. Kids assume this is an acceptable response and begin to reward bad and good days with things they want because they believe they “earned” it. When we feel the need to rationalize a purchase, it’s generally because we know deep down that we shouldn’t have bought it in the first place. It’s a dangerous habit to form and one we don’t want to demonstrate to our kids. I want my girls to correlate hard work with earning money for the things that truly make them happy. I demonstrate this to my girls by setting goals and honoring them. I tell them when I’ve had a bad a day and feel tempted to buy something to make myself feel better. Then I also tell them why I don’t—my goals mean more to me and tomorrow I will most likely regret that purchase, which will make me feel even worse. And if I find out tomorrow that I still want that item, then I’ll save for it and make a conscious decision to buy it, rather than buy it out of anger, frustration, loneliness, boredom etc. What have you been told or told your kids about money that you regret? The Heavy Purse Store is now open! My new downloadable Money Club Workbooks—based on age or level of expertise—are now on sale. Each workbook provides five targeted lessons to help you grow Money Smart Kids. Please check them out in The Heavy Purse Store. I can relate to most of these statements. "We can't afford it" has to be the most damaging to a kid I would imagine...it sure does create a kind of fear in them and finding an alternative way of phrasing or demostrating it would soften the blow. In terms of actions to avoid, just don't give kids money, let them "earn it" somehow by helping out at home etc. It imprints the lesson of hardwork = some cash in their minds and its a lesson worth learning early on. Most parents use "we can't afford it" out of habit and don't think about the accidental fear they could instill. But helping kids understand that money has a purpose (goals) and that you're choosing to use money to support those goals is different. It's a great example to set and doesn't create any fear. I, too, am a big believer in letting kids earn money, rather than just giving them money. One thing having a son has really made me aware of are the little times I contradict myself, like your example of "I earned this". When you're responsible for setting an example for someone and they're so impressionable, you really have to take on a whole new awareness of yourself and confront some things that you may not be totally comfortable with. But if you can do it, not only will you set a better example for your children but you'll also make yourself a little bit better. It's so easy to contradict yourself, and it's honestly done with innocence in most situations. But over time, kids really begin to notice and it minimizes what you're trying to teach your kids. I find that I really benefit too from being a good financial role model, an added perk! Love this, Shannon. It's SO important that we work to be honest and yet tactful with our children where money issues are concerned. Like you mentioned, if kids misinterpret our words, we can come across as being dishonest or else we can create fear, and that can lead to big money problems down the road for our babies. Great post! Thanks, Laurie! When money is taboo is so many homes so they only things kids are taught is what they observe. It is incredibly important to be honest with kids and help them develop a positive relationship with money. Our money hang-ups become theirs unless we break the cycle and proactively teach them about money. I tell my daughter that we can't afford things all the time. But, I try to say "we can't afford this because we're saving money X instead." I don't think it stresses her out. She really needs to know that we can't afford everything that her heart desires. While "we can't afford this" is still not my favorite phrase, you're still explaining "why" which is the most important part and what many parents skip. Kids do need to learn that they cannot buy everything see and need to figure out what they truly want and save for it - just like you do. I agree...it's about the wording. My daughter is smart. I try to explain that we "can't afford this because we're doing this." I think she gets it. Absolutely, Holly. You make it clear that the money is intended for something else. You're not making a decision on a whim or because money is truly scarce, but because it has another purpose that she understands. I've been guilty of not being able to afford and I think you're right on Shannon. We've moved towards your strategy of reminding them how whatever it is doesn't fit into our goals our would not allow us to reach our goals and find that it does work better. In fact, it just gets them more excited about whatever it is we're saving for. Absolutely, John! We experience the same thing. When we draw the girls' attention back to our family goal, it renews their excitement. It's something they want so walk away without feeling deprived, which I think is also very important. Many of us can remember feeling deprived as kids because we couldn't get everything we want. When kids understand the reason "why" it helps mitigate those feelings of deprivation because there is a valid reason behind it. It's not Mom and Dad being mean. We often hear people use the phrase "we can't afford it" as their way of simply meaning that they do not want to pay for something, and you are so right, when kids hear that they take it to heart. It could simply mean that the person has their money designated for something else. When I first started PF blogging Ashley at Money Talks wrote a post about "We can't afford it", that I will always remember. She said (similar to what you said) that she tells her family, or friends, "we choose not to spend our money on that" instead of we can't afford it. That way the parents do not come across as broke, but have still made their point. Whether it is with kids or when friends ask you to go out for a night on the town, and you know it will be expensive, and you rather not, you can simply say we choose not to spend money on that. Love it - "we choose not to spend on our money on that". Being a conscious spender is so important. We all have a finite amount of money and the best thing we can do is spend it on the things that matter most to us. My daughter is 3, so I haven't had to utter these phrases yet. But I remember hearing "We can't afford it" quite a bit, growing up. I totally agree with you. I know I learned the most about money by just watching and listening to my parents, so it's important to be careful what you say around them. So many parents don't realize how much their kids learn through just observing them. Often time they pick up things we would prefer they didn't. :) It is important to be mindful of the words we use and our actions. It can make a huge difference to our kids and it only benefits us too. Great points, Shannon, especially the third one. Buyer's remorse almost always occurs when spending is a way of dealing with negative feelings (at least in my case!). Thanks, Anna! We are all emotional shoppers to a degree and helping our kids realize that shopping may not be the best way to handle our emotions is an important lesson. It's such a common phrase that I imagine everyone has uttered it once or twice. It doesn't seem harmful but I have seen the lasting effects. It's why goals are so important to me. It gives me a great response then I think it's important to give the girls a choice as to whether it's something they want to spend their money on. My son isn't yet 3. The worst thing I taught him? Where the stopper on the piggy-bank is. His bank was full (too full for him to even pick up!) so I decided to roll up all the coins and invest them on his behalf. He saw me open it once. Now he opens it up all the time and coins fly everywhere. I have always been averse to using "I can't afford it" too. It can scare a child to think they won't be provided for. I agree you should say "we don't need it " or I often say "I'll spend my money elsewhere on something else that I want or need more". "I can't afford it" can definitely have scary connotations to children and many times what they are imagining isn't even true. However, letting our kids see we make mindful choices with our money and spend it on what matters most to us - is a good thing! LOL! We definitely don't want to make them budget adverse either. :) That's why I always refer back to our goals, so they understand that I'm choosing to use the money for our goal of a family vacation over a doll. They get excited about the trip and forget about the toy. I'd never considered watching saying that you can't afford something around kids. I guess it makes sense - it also indicates that if you had the money, you'd buy it - frivolousness. Saying "we aren't going to be spending our money on that " is better. Most parents don't because they say it in innocence but the meaning can interpreted very differently by our kids. To me, it's important that my daughters understand that money has a purpose and I don't spend it arbitrarily. By letting them know I'm choosing not to spend money on that item because it's intended for something else helps demonstrate that message. Too many parents today spoil their children and enable them. Since a lot of Americans are bad with their money, it is a big reason why their kids are in debt also. Sadly, many parents in their quest to be good parents and give their children better lives inadvertently created entitled kids when they give them everything they want. It's why it's so important for parents to be good financial role models to their children and actively teach them how to handle their money. Absolutely, you don't want to scare your kids, but teach them how to treat money respectfully and understand how to make conscious decisions with their money. There is nothing wrong with wanting something, but we need to understand where it fits in with our goals and priorities first. And if it is something we truly want, then to know to save for it. I try really hard not to ever say we can't afford something. I usually try to say we don't want to use our money for that or that's not something we need. I try really hard to explain everything in great detail, and sometimes what gets retained is really surprising. We were trying to explain why the government had to shut down to our daughter, and she had some interesting insights that I will post about Friday. They understand more than you think, so it's very important not to get their minds going in a negative direction. My son is too young for me to have these conversations with him, but you are right. In the "we can't afford this" part, I would use that opportunity to teach my son the difference between wants and needs. Soon, Grayson, soon you'll be chasing him up and down the store aisles. Taking things out of the shopping cart and so forth. :) Absolutely, it's the perfect time to have a wants and needs conversation. And I find now that girls know that the likelihood of me saying "yes" is pretty low, they immediately start thinking about ways to earn money to buy it, if it something they decide they truly want. I don't have children, but I have seen first hand how literal their minds work. One really needs to be on their toes when talking about adult style issues in front of their little ones. Definitely a responsibility that can't be ignored. Thanks again for this informative post and take care. All the best. Thanks, Lyle! We often don't give our kids enough credit because they hear and see far more than we think they do (and sometimes want them to). We definitely have to be mindful about our words and actions because they will mimic you. Appreciate you stopping by, Lyle. All the best to you too. Shannon, this is SUCH a big one -> "We Can’t Afford It." My parents certainly weren't poor, and we were definitely middle class, but as you know there is a wide range in the middle class as well as approach towards personal finance. My parents were very frugal but did say "we can't afford it" to many things. Well, of course I wanted to be able to afford it and wondered why we couldn't! This had a profound impact on my life (ultimately for the better) but if they hadn't said that or explained the situation a bit better I could have saved myself some time and frustration, as I looked for answers in books, magazines, the internet, etc. "We can't afford it" is such a fallback for most parents and they believe it's a harmless answer, but it's really not. Especially when they forget to qualify "why" we can't afford it. They are certainly right to not buy everything they see or everything their kids want, but there needs to be an explanation so their kids understand "why" and recognize that Mom and Dad are making mindful decisions. That's a great list. Something my parents often said was "we can't get that because it costs money". I'm sure they meant to inform me that everything isn't free in life, but it really came across as "we don't buy things because we don't have money". It's tough to know how a kid is going to interpret things sometimes! It is tough to know how kids will interpret something. And sometimes it's not even the words that resonate the strongest but the emotions behind the words. Most parents have the best intentions but we definitely need to be mindful of our words and emotions when we talk to kids about money. Eek! I've said that we can't afford quite a few things! My little girl is only 3 years old so hopefully there's no lasting effects. Great advice and I can really use this Shannon, thank you! I think every parent has said "we can't afford it" at least once. :) I'm glad the tips were helpful and you're daughter is at the perfect age to benefit from your guidance and being a good financial role model. I suffered from the first point. My dad left his job and didn't become as successful as he thought with his own business but they were a bit too dramatic with the reality and so it was complicated to understand as a kid. I remember you talking about that previously. It can be very complicated to understand what's going on in our parent's lives and a good reminder to be mindful of how our reactions affects our children. I am guilty of #1. And I really never thought about how saying "We can't afford it" and then spending money on other things makes us look like liars. Ouch! Lesson learned. Thank you for sharing this! You're welcome, Donna! I think we've been guilty of #1. We say without intending any harm but kids sometimes misinterpret our words or let their imagination get the best of them. Great advice - I can distinctly remember when my parents started to say "we can't afford it", and recall the high level of anxiety this provoked. Thanks, Sue. I hear that frequently from others. Even though it wasn't their parents intent, it did cause fear and anxiety that we still remember years later. We sometimes forget how powerful our words are. Great tips! I have to admit, I've used a similar version to #1, though I have modified it to "I don't have the money for that item." Then I go over how much my kid would have to save to purchase it himself and possible extra jobs he can do around the house to achieve that amount of money. So far I think it's working. Each of my boys has a savings goal, striving to get something that they want but is not in the household budget right now. Happy Friday, Carol! It's great that you're giving your kids a chance to earn the money themselves to buy things they want. It's so important for them to think about how much work and effort has to go into earning something and to make sure that it's really worth all their effort. We don't always think about that as adults, and we'd be surprised how many hours we work for some of things we buy. Great job! My kids probably thought the same because I used to use that on my kids too. Now that they're growing up they are understanding the value of money. They still have their moments, after all they're teens! The good thing is now that they are making their own money they realize how important it is to make smart purchases and save. Great tips Shannon, thanks for sharing this post with us! Have a great weekend :)! The most important thing is now your kids are learning how to make smart choices with their money. :) Hope you had a great weekend too! Oh man, I am going to confess I have said some of these things at one time or another. I'm thankful that life has changed a bit for me where I now hear my kids say I have taught them they can do or achieve whatever they set their minds too. I never thought about how saying, Its my money and I've worked hard for it can be heard from a little one to create concern. Thanks, Irish! I appreciate your kind words!! We've all been guilty of saying "we can't afford it" but it sounds like you also been a great Mom and role model to your children too. Thanks for stopping by and commenting! Great article! These are very simple things that people often overlook. Definitely worth sharing to parents and future parents. Thanks for this. You're welcome, Marissa! Most of these phrases are so common and parents certainly have no intention of creating fear or bad habits but it does happen. You have had me thinking about this! My parents used to just say "No" or "You don't need that. If you want it, use your own money." Of course we didn't have much money of our own. I remember drooling over a $60 sweater when I was in high school. Even after babysitting quite a lot and saving for what seemed like forever, I just couldn't part with my hard-earned money. Besides, by the time I had enough to buy it, the sweater no longer seemed so wonderful! I told our kids pretty much the same thing as my parents did. It seemed to be a good way to handle it. I have to comment about the "I work so hard that I deserve it" mentality. So often I hear people say, "I deserve it." And their friends chime in with "Yes, you really do deserve it!" Who will say to a friend, "No, you don't deserve it"? The whole idea of deserving is strange. Why don't we all deserve caviar for breakfast?! Now that girls buy a lot the things they want, they have really gotten good at slowing down and making sure that the item is truly something they want. It's so great to see and they walk away without feeling deprived or upset. They know they made the right decision. "I work hard and deserve it" seems so innocent. And while I absolutely believe people should use their money on the things that make their hearts happy, when we think we "deserve" something, it can create a sense of entitlement. I don't have kids yet but these are great things to remember! Even the last one for myself, to not shop when I'm having a bad day or something happens that I try to make myself feel better. I normally do regret the purchase, not that I can't use what I've bought but my ultimate goal is to be debt free and I can't do that if I'm buying clothes I don't need. Thanks for the reminder! It happens to everyone Arelis. Money is emotional was one of the most important lessons my father taught me. It's easy to think "we deserve it" when we've had a bad day. It's a good thing you're recognizing your goal of being debt-free as more important so when you do splurge on something - it's something you really can enjoy and not regret.